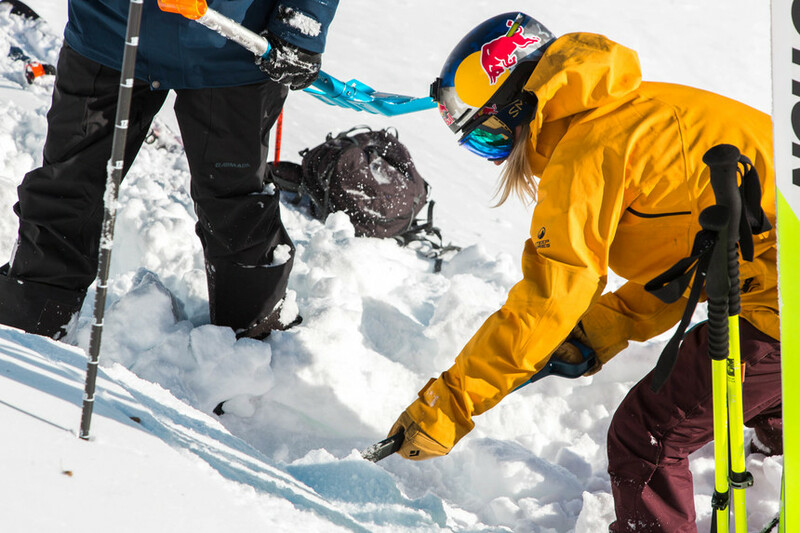 The majority of time during an avalanche rescue is spent moving of snow to uncover a buried partner. In the average rescue, several tons of snow must be moved. Moving this much snow takes not only time, but is physically extremely taxing. 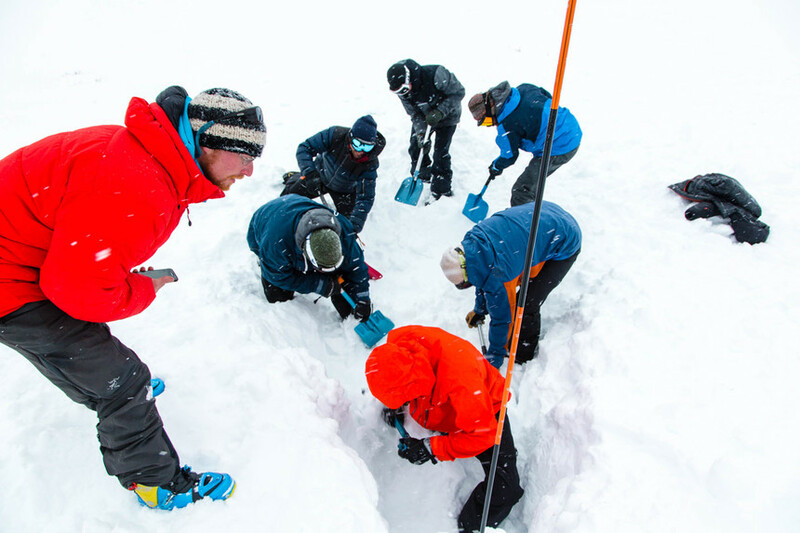 In order to maximize efficiency, thereby decreasing the time it takes to uncover an airway for a buried victim, here are 4 simple steps to strategic rescue shoveling. Fumbling with complicated zippers, or having to move stuff around in your pack to access your rescue shovel takes up precious time when it is needed most. Always carry your shovel in a dedicated outside pocket of your snow pack, or have it be easily accessible in an inside pocket, not buried beneath layers of clothing or your camera. 2: Start shoveling downhill of a probe strike. Once you have a achieved a positive probe strike, leave the probe in that exact location and start digging at a spot downhill to the victim, moving uphill as you progress. Remember, you are digging for an entire person, so you will have to move A LOT of snow. Remember, dig in, not down. When digging with a group, use a “Flying V” formation to move snow efficiently. A point shoveler uses their shovel to cut large blocks and moves them backwards along both lines of the V. Shovelers to the rear keep passing the snow back, the rearmost shovelers clear the blocks downhill. The point shoveler does the most work, so make sure to rotate positions every 90 seconds to keep moving snow as fast as possible. 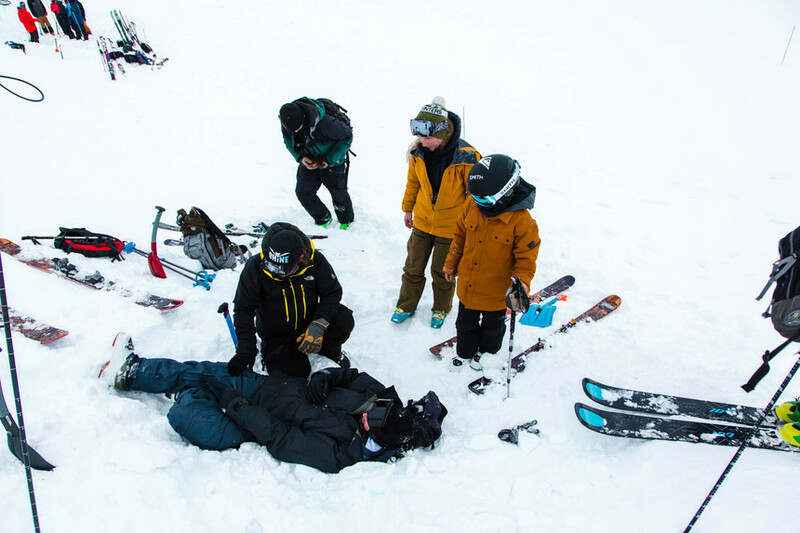 Avalanches are violent forces of nature, and will likely injure those caught in them. This means that once you have uncovered a victim, they will likely need medical attention like CPR. Once you have reached the victim, dig to the side to create a platform at the same height as them in order to have a place to provide immediate medical attention if necessary. This is some seriously helpful tips one should be knowing when they are going uphill. We cannot predict these avalanches and when it happens it would be so violent. Most of the people die because of the lack of fast recovery. If you can follow these tips, it would be much easier to rescue them.